Marvin Arthur Wolfman (born May 13, 1946) is an American comic book and novelization writer. He worked on Marvel Comics's The Tomb of Dracula, for which he and artist Gene Colan created the vampire-slayer Blade, and DC Comics's The New Teen Titans and the Crisis on Infinite Earths limited series with George Pérez. Marv Wolfman was born in Brooklyn, New York City, the son of police officer Abe and housewife Fay. He has a sister, Harriet, 12 years older. When Wolfman was 13, his family moved to Flushing, Queens, in New York City, where he attended junior high school. He went on to New York's High School of Art and Design, in Manhattan, hoping to become a cartoonist. Wolfman is Jewish. Marvin Wolfman was active in fandom before he began his professional comics career at DC Comics in 1968. Wolfman was one of the first to publish Stephen King, with "In A Half-World of Terror" in Wolfman's horror fanzine Stories of Suspense #2 (1965). This was a revised version of King's first published story, "I Was a Teenage Grave Robber", which had been serialized over four issues (three published and one unpublished) of the fanzine Comics Review that same year. Wolfman's first published work for DC Comics appeared in Blackhawk No. 242 (Aug.–Sept. 1968). He and longtime friend Len Wein created the character Jonny Double in Showcase No. 78 (Nov. 1968) scripted by Wolfman. The two co-wrote "Eye of the Beholder" in Teen Titans No. 18 (Dec. 1968), which would be Wein's first professional comics credit. Neal Adams was called upon to rewrite and redraw a Teen Titans story which had been written by Wein and Wolfman. The story, titled "Titans Fit the Battle of Jericho! ", would have introduced DC's first African American superhero, but was rejected by publisher Carmine Infantino. The revised story appeared in Teen Titans No. 20 (March–April 1969). Wolfman and Gil Kane created an origin for Wonder Girl in Teen Titans No. 22 (July–Aug. 1969) which introduced the character's new costume. He and artist Bernie Wrightson co-created Destiny in Weird Mystery Tales No. 1 (July–Aug. 1972), a character which would later be used in the work of Neil Gaiman. In 1972, Wolfman moved to Marvel Comics as a protégé of then-editor Roy Thomas. When Thomas stepped down, Wolfman eventually took over as editor, initially in charge of the publisher's black-and-white magazines, then finally the color line of comics. Wolfman said in 1981 that, "Marvel never gave [its] full commitment to" the black-and-white line. "No one wanted to commit themselves to the staff." He added, "We used to farm the books out to Harry Chester Studios [sic] and whatever they pasted up, they pasted up. I formed the first production staff, hired the first layout people, paste-up people." Wolfman stepped down as editor-in-chief in order to spend more time writing. He and artist Gene Colan crafted The Tomb of Dracula, a horror comic that became "one of the most critically-acclaimed horror-themed comic books ever". During their run on this series, they created Blade, a character who would later be portrayed by actor Wesley Snipes in a film trilogy. Wolfman co-created Bullseye in Daredevil No. 131 (March 1976). He and artist John Buscema created Nova in that character's eponymous first issue. Wolfman and Gil Kane adapted Edgar Rice Burroughs' Barsoom concepts into comics in Marvel's John Carter, Warlord of Mars series. Wolfman wrote 14 issues of Marvel Two-in-One starting with issue No. 25 (March 1977). The Spider-Woman series was launched in April 1978 by Wolfman and artist Carmine Infantino. As the first regular writer on Spider-Woman, he redesigned the character, giving her a human identity as Jessica Drew. Wolfman succeeded Len Wein as writer of The Amazing Spider-Man and in his first issue, No. 182 (July 1978), had Peter Parker propose marriage to Mary Jane Watson who refused, in the following issue. Wolfman and Keith Pollard introduced the likable rogue the Black Cat (Felicia Hardy) in The Amazing Spider-Man No. 194 (July 1979). In 1978, Wolfman and artist Alan Kupperberg took over the Howard the Duck syndicated newspaper comic strip. While writing the Fantastic Four, Wolfman and John Byrne introduced a new herald for Galactus named Terrax in No. 211 (Oct. 1979). A Godzilla story by Wolfman and Steve Ditko was changed into a Dragon Lord story published in Marvel Spotlight vol. 2 No. 5 (March 1980). The creature that the Dragon Lord battled was intended to be Godzilla but since Marvel no longer had the rights to the character (which lapsed the previous year) the creature was modified to a dragon called The Wani. In 1980, Wolfman returned to DC after a dispute with Marvel. Teaming with penciller George Pérez, Wolfman relaunched DC's Teen Titans in a special preview in DC Comics Presents No. 26 (October 1980). The New Teen Titans added the Wolfman-Pérez creations Raven, Starfire and Cyborg to the old team's Robin, Wonder Girl, Kid Flash, and Beast Boy (renamed Changeling). The series became DC's first new hit in years; Christopher J. Priest called Deathstroke, another new character, "the first modern supervillain". Wolfman wrote a series of New Teen Titans drug awareness comic books which were published in cooperation with The President's Drug Awareness Campaign in 1983–1984. The first was pencilled by Pérez and sponsored by the Keebler Company, the second was illustrated by Ross Andru and underwritten by the American Soft Drink Industry, and the third was drawn by Adrian Gonzales and financed by IBM. In August 1984, a second series of The New Teen Titans was launched by Wolfman and Pérez. Other projects by Wolfman for DC during the early 1980s included collaborating with artist Gil Kane on a run on the Superman feature in Action Comics; a revival of Dial H for Hero with Carmine Infantino; launching Night Force, a supernatural series drawn by Gene Colan; and a nearly two-year run on Green Lantern with Joe Staton. During their collaboration on that series, Wolfman and Staton created the Omega Men in Green Lantern No. 141 (June 1981). Wolfman briefly wrote Batman and co-created the Electrocutioner in issue No. 331 (Jan. 1981). Wolfman was one of the contributors to the DC Challenge limited series in 1986. After Pérez left The New Teen Titans in 1985, Wolfman continued for many years with other collaborators – including pencillers José Luis García-López, Eduardo Barreto and Tom Grummett. In December 1986, Wolfman was informed by Marvel writer Chris Claremont that a DC executive had approached Claremont at a holiday party and offered him the position of writer on The New Teen Titans. Claremont immediately declined the offer and told Wolfman that apparently the publisher was looking to replace him on the title. When Wolfman confronted DC executives about this, he was told it was "just a joke", although Claremont reiterated that he took it to be a credible and official offer. In 1985, Wolfman and Pérez launched Crisis on Infinite Earths, a 12-issue limited series celebrating DC's 50th anniversary. Featuring a cast of thousands and a timeline that ranged from the beginning of the universe to the end of time, it killed scores of characters, integrated a number of heroes from other companies to DC continuity, and re-wrote 50 years of DC universe history in order to streamline it. After finishing Crisis, Wolfman and Pérez produced the History of the DC Universe limited series to summarize the company's new history. Wolfman was involved in the relaunch of the Superman line as well, reinventing nemesis Lex Luthor and initially scripting the Adventures of Superman title with Jerry Ordway as the artist. During this period they introduced Bibbo Bibbowski and Professor Emil Hamilton. Wolfman got into a public dispute with DC over a proposed ratings system, which led to his being relieved of his editorial duties by the company. DC offered to reinstate Wolfman as an editor provided he apologize for making his criticism of the ratings system public, rather than keeping them internal to the company, but he declined to do so. Wolfman returned to the Dark Knight for another brief run on Batman and Detective Comics, writing "Batman: Year Three", creating Robin III Tim Drake as well as Abattoir and a new version of the Electrocutioner, and writing an anniversary adaptation of the first ever Batman story, which was printed along with two other adaptations and the original. He continued as The New Titans writer and revitalized the series with artist Tom Grummett. Wolfman wrote the series until the title's last issue. Wolfman's writing for comics decreased as he turned to animation and television, though he wrote the mid-1990s DC series The Man Called A-X. In the early-1990s, Wolfman worked at Disney Comics. He wrote scripts for a seven part DuckTales story ("Scrooge's Quest"), as well as several others – with the characters from the Mickey Mouse universe – that appeared in Mickey Mouse Adventures. He was editor of the comics section on the Disney Adventures magazine for the early years of the publication. In the late 1990s, Wolfman developed the Transformers TV series Beast Machines, which aired on Fox Kids for two seasons from 1999–2000. The program was a direct continuation of the Beast Wars series, which itself was a continuation of the original Generation One Transformers show. Beast Machines was met with mixed reviews, as the show was praised for its story, but was criticized for its lack of action in comparison to other Transformers shows. Previously, in the 1980s, Wolfman wrote the story for Optimus Prime's return in "The Return of Optimus Prime" of the third season of Transformers. A decade later, Wolfman began writing in comics again, scripting Defex, the flagship title of Devil's Due Productions' Aftermath line. He wrote an "Infinite Crisis" issue of DC's "Secret Files", and consulted with writer Geoff Johns on several issues of The Teen Titans. Wolfman wrote a novel based on Crisis on Infinite Earths, but rather than following the original plot, he created a new story starring the Barry Allen Flash that takes place during the original Crisis story. Wolfman wrote the novelization of the film Superman Returns, and worked on a direct-to-video animated movie, Condor, for Stan Lee's Pow Entertainment. In 2006, Wolfman was editorial director of Impact Comics (no relation to the DC Comics imprint), publisher of educational manga-style comics for high school students. That same year, starting with issue No. 125, Wolfman began writing DC's Nightwing series. Initially scheduled for a four-issue run, Wolfman's run was expanded to 13 issues, and finished with No. 137. During the course of his run, Wolfman introduced a new Vigilante character. Following Wolfman's departure from the pages of Nightwing, the Vigilante was spun off into his own short-lived title, which Wolfman wrote. He wrote a miniseries starring the Teen Titan Raven, a character he and George Pérez co-created during their run on The New Teen Titans, helping to revamp and update the character. He is working with Pérez on a direct-to-DVD movie adaptation of the popular "Judas Contract" storyline from their tenure on Teen Titans. In 2011, he and Pérez completed the New Teen Titans: Games graphic novel, which they had begun working on in the late 1980s. Wolfman revived his Night Force series with artist Tom Mandrake in 2012. He served as writing consultant on the video game Epic Mickey 2: The Power of Two, which he was nominated for a Writers Guild of America Award for Outstanding Achievement in Videogame Writing. In 2015, Wolfman wrote a novelization of the videogame Batman: Arkham Knight. And in 2016 he published the novelization of the Suicide Squad film through Titan Books. In 1997, on the eve of the impending release of the Blade motion picture, Wolfman sued Marvel Characters Inc. over ownership of all characters he had created for Marvel Comics. A ruling in Marvel's favor was handed down on November 6, 2000. Wolfman's stance was that he had not signed work-for-hire contracts when he created characters including Blade and Nova. In a nonjury trial, the judge ruled that Marvel's later use of the characters was sufficiently different to protect it from Wolfman's claim of copyright ownership. Wolfman is married to Noel Watkins. Wolfman was previously married to Michele Wolfman, for many years a colorist in the comics industry. They have a daughter, Jessica Morgan. Wolfman, on the panel "Marvel Comics: The Method and the Madness" at the 1974 New York City Comic Art Convention, told the audience that when he first began working for DC Comics, he received DC's first writing credit on its mystery magazines. Gerry Conway, who wrote the horror-host interstitial pages between stories, wrote in one issue that the following story was told by a "wandering Wolfman." The Comics Code Authority, which did not permit the mention of werewolves or wolfmen, demanded it be removed. DC informed the Authority that "Wolfman" was the writer's last name, so the Authority insisted he be given a credit to show the "Wolfman" was a real person. Once Wolfman was given a credit, other writers demanded them as well. Shortly, credits were given to all writers and artists. 1979 Inkpot Award in 1979. 1982 Eagle Award for "Best New Book" and 1984 and 1985 Eagle Awards for "Best Group Book" for New Teen Titans. Wolfman and artist George Pérez' Crisis on Infinite Earths won the 1985 and 1986 Jack Kirby Awards for Best Finite Series. In 1985, DC Comics named Wolfman as one of the honorees in the company's 50th anniversary publication Fifty Who Made DC Great. 1986 Nominated for the Comics Buyer's Guide Award for Favorite Writer in 1986, and his work on the "Batman: Year Three" story arc in Batman #436–439 was nominated Comics Buyer's Guide Favorite Writer Award in 1990. 2007 Scribe Award for "Adapted Speculative Fiction Novel", given by writers of novelization and tie-in fiction for his novel based on Superman Returns. 2008 National Jewish Book Award for "Children's and Young Adult Literature", for nonfiction book Homeland, The Illustrated History of the State of Israel. 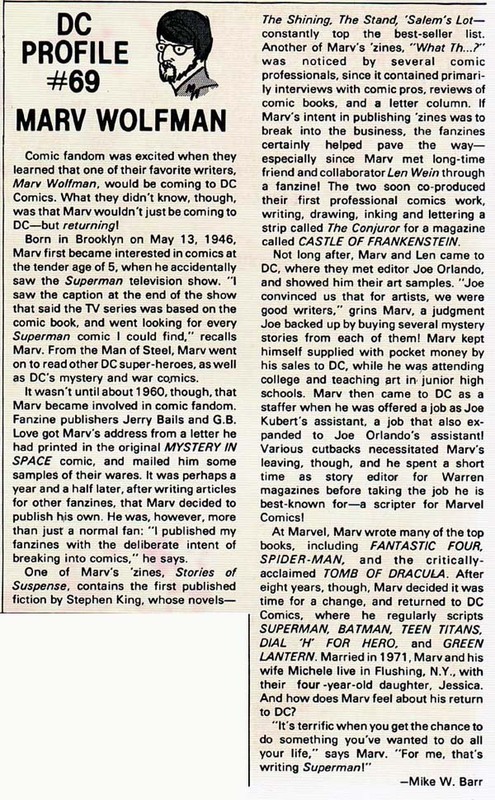 ^ a b "Marv Wolfman interview". Alter Ego (112). October 2012. p. 3. ^ Parker Royal, Derek (2016). Visualizing Jewish Narrative: Jewish Comics and Graphic Novels. London: Bloomsbury Publishing. p. 15. ISBN 978-1474248792. ^ Lovett, Jamie (November 10, 2013). "Marv Wolfman Talks Tim Drake, Writing Minority Characters, And Why He Was Glad the Judas Contract Film Was Cancelled". Comicbook.com. Archived from the original on September 23, 2018. I'm Jewish, and I think I've written maybe two Jewish characters in my entire life. ^ Jimenez, Phil (2008). "Jonny Double". In Dougall, Alastair (ed.). The DC Comics Encyclopedia. London, United Kingdom: Dorling Kindersley. p. 110. ISBN 0-7566-4119-5. ^ McAvennie "1970s" in Dolan, p. 152 "The host that was first presented in a framing sequence by scribe Marv Wolfman and artist Bernie Wrightson would provide endless creative material for Neil Gaiman's The Sandman series decades later." ^ Sanderson, Peter; Gillis, Peter B. (September – October 1981). "Comics Feature Interviews Marv Wolfman". Comics Feature. New Media Publishing (12/13): 44. ^ Markstein, Don. "Gene Colan". Don Markstein's Toonopedia. Archived from the original on February 4, 2012. Retrieved February 3, 2012. ^ Sanderson "1970s" in Gilbert (2008), p. 175 "In March , writer Marv Wolfman and artist Bob Brown co-created one of the Man Without Fear's greatest nemeses, Bullseye." ^ Ewbank, Jamie (August 2013). "Idol of Millions: The Thing in Marvel Two-in-One". Back Issue!. Raleigh, North Carolina: TwoMorrows Publishing (66): 29–30. ^ Manning "1970s" in Gilbert (2012), p. 103: "As new regular writer Marv Wolfman took over the scripting duties from Len Wein and partnered with artist Ross Andru, Peter Parker decided to make a dramatic change in his personal life." ^ Manning "1970s" in Gilbert (2012), p. 107: "Spider-Man wasn't exactly sure what to think about his luck when he met a beautiful new thief on the prowl named the Black Cat, courtesy of a story by writer Marv Wolfman and artist Keith Pollard." ^ "Howard the Duck". Nemsworld.com. n.d. Archived from the original on September 6, 2015. Retrieved March 19, 2011. ^ "Alan Kupperberg". Lambiek Comiclopedia. May 29, 2009. Archived from the original on October 19, 2014. Retrieved April 9, 2009. ^ DeFalco, Tom "1980s" in Gilbert (2008), p. 197: "Tako Shamara became the Dragon Lord in Marvel Spotlight No. 5 by writer/editor Marv Wolfman and artist Steve Ditko." ^ Manning, Matthew K. "1980s" in Dolan, p. 188 "[The New Teen Titans] went on to become DC's most popular comic team of its day. Not only the springboard for the following month's The New Teen Titans No. 1, the preview's momentous story also featured the first appearance of future DC mainstays Cyborg, Starfire, and Raven." ^ MacDonald, Heidi (October 1982). "DC's Titanic Success". The Comics Journal. Seattle, Washington: Fantagraphics Books (76): 46–51. ^ Levitz, Paul (2010). 75 Years of DC Comics The Art of Modern Mythmaking. Taschen America. p. 454. ISBN 978-3-8365-1981-6. [Marv Wolfman and George Pérez] created a title that would be DC's sales leader throughout the 1980s. ^ Priest, Christopher (November 10, 2016). "Exclusive Interview – Christopher Priest Talks Superman vs. Deathstroke". Superman Homepage. Marv created the first modern supervillain. He broke every rule by making Deathstroke three-dimensional and giving him internal conflicts while maintaining a level of skeeve we weren’t used to seeing from a typical 2-dimensional bad guy. ^ "The New Teen Titans (Keebler Company) #1". Grand Comics Database. ^ "The New Teen Titans (American Soft Drink Industry) #2". Grand Comics Database. ^ "The New Teen Titans (IBM) #3". Grand Comics Database. ^ Manning "1980s" in Dolan, p. 209: "As one of DC's most popular team books, The New Teen Titans was a natural choice to receive the deluxe paper quality and higher price point of the new Baxter format. With the regular newsstand title having already changed its name to Tales of the Teen Titans with issue No. 41, the path was clear for a new comic to once again be titled The New Teen Titans. Featuring the trademark writing of Marv Wolfman and the art of George Pérez, this second incarnation was a success from the start, providing readers with the perfect blend of high-quality paper with high-quality storytelling." ^ Manning "1980s" in Dolan, p. 192 Legion of Super-Heroes No. 272 "Within a sixteen-page preview in Legion of Super-Heroes #272...was "Dial 'H' For Hero," a new feature that raised the bar on fan interaction in the creative process. The feature's story, written by Marv Wolfman, with art by Carmine Infantino, saw two high-school students find dials that turned them into super-heroes. Everything from the pair's civilian clothes to the heroes they became was created by fans writing in. his concept would continue in the feature's new regular spot within Adventure Comics." ^ Manning "1980s" in Dolan, p. 197 The New Teen Titans No. 21 "[T]his issue...hid another dark secret: a sixteen-page preview comic featuring Marv Wolfman's newest team – Night Force. Chronicling the enterprise of the enigmatic Baron Winters and featuring the art of Gene Colan, Night Force spun out into an ongoing title of gothic mystery and horror the following month." ^ Manning "1980s" in Dolan, p. 193 Green Lantern No. 141 "DC's newest science-fiction franchise, a band of over one hundred aliens called the Omega Men." " They gave Green Lantern a run for his money in this issue written by Marv Wolfman, with art by Joe Staton, and the Omega Men went on to gain their own ongoing series in 1983." ^ Greenberger, Robert (August 2017). "It Sounded Like a Good Idea at the Time: A Look at the DC Challenge!". Back Issue!. Raleigh, North Carolina: TwoMorrows Publishing (98): 42–43. ^ Daniels, Les (1995). DC Comics: Sixty Years of the World's Favorite Comic Book Heroes. New York, New York: Bulfinch Press. p. 135. ISBN 0821220764. I knew that I had this incredible artist who could draw almost anything that I wanted...So I decided to make the story just the biggest spectacle I could come up with. ^ "Harlan Ellison Speaks at San Diego". The Comics Journal. Seattle, Washington: Fantagraphics Books (119): 14. January 1988. ^ Manning "1980s" in Dolan, p. 226 "The original Superman title had adopted the new title The Adventures of Superman but continued the original numbering of its long and storied history. Popular writer Marv Wolfman and artist Jerry Ordway handled the creative chores. ."
^ "Miller". The Comics Journal. Seattle, Washington: Fantagraphics Books (115): 20–21. April 1987. ^ "Newswatch: Marv Wolfman fired by DC as editor". The Comics Journal. Seattle, Washington: Fantagraphics Books (115): 9–10. April 1987. ^ Manning "1990s" in Dougall (2014), p. 190: "Marv Wolfman and penciller Jim Aparo introduced serial killer Abattoir." ^ Manning "1990s" in Dougall (2014), p. 191: "Marv Wolfman and artist Jim Aparo continued their run...by introducing the second villain to bear the name of the Electrocutioner." ^ Manning "1990s" in Dolan, p. 249: "Writer Marv Wolfman had revitalized the Titans franchise yet again, with the help of his new creative partner, artist Tom Grummett." ^ Wolfman, Marv (November 7, 2007). "Donald Duck goosed". MarvWolfman.com. Archived from the original on December 14, 2007. ^ Wolfman, Marv (August 24, 2007). "Disney Adventures R.I.P." MarvWolfman.com. Archived from the original on December 12, 2007. ^ a b Epstein, Daniel Robert (May 24, 2007). "Catching Up With Marv Wolfman". Newsarama. Archived from the original on May 26, 2007. Retrieved January 29, 2011. ^ Campbell, Josie (March 6, 2012). "Wolfman Revisits Baron Winters & Night Force". Comic Book Resources. Archived from the original on March 10, 2012. Retrieved March 10, 2012. ^ "2013 Writers Guild Awards New Media and Videogame Nominees Announced". Writers Guild of America. January 16, 2013. Archived from the original on September 12, 2015. ^ Schedeen, Jesse (February 2, 2015). "Marv Wolfman to Write Batman: Arkham Knight Novelization". IGN. Archived from the original on July 29, 2015. ^ Suicide Squad: The Official Movie Novelization In: titanbooks.com. Abgerufen am 30. Dezember 2016. ^ a b Dean, Michael (November 2001). "Post Mortem: Marv Wolfman Talks About His Day in Court". The Comics Journal (239). Seattle, Washington: Fantagraphics Books. Archived from the original on May 10, 2008. ^ Dean, Michael (November 16, 2000). "Wolfman loses Blade lawsuit against Marvel". The Comics Journal (229). Seattle, Washington: Fantagraphics Books. Archived from the original on February 24, 2012. Retrieved January 7, 2011. ^ "Wolfman, Marv. "Confessions of a Comic Book Writer," Spider-Woman No. 1 (April 1978). ^ Cronin, Brian (September 6, 2007). "Comic Book Urban Legends Revealed #119". Comic Book Resources. Archived from the original on July 5, 2013. Retrieved January 7, 2011. ^ a b "Eagle Awards". Hahn Library Comic Book Awards Almanac. n.d. Archived from the original on September 10, 2015. ^ "1980s Kirby/Eisner Award Recipients". San Diego Comic-Con International. 2015. Archived from the original on September 5, 2015. ^ "1986 Comics Buyers Guide Fan Awards". Hahn Library Comic Book Awards Almanac. n.d. Archived from the original on September 10, 2015. ^ "1990 Comics Buyers Guide Fan Awards". Hahn Library Comic Book Awards Almanac. n.d. Archived from the original on September 25, 2013. ^ "Book awards: Scribe Award". LibraryThing. n.d. Archived from the original on October 18, 2012. Retrieved January 31, 2011. ^ "NJBA Winners". Jewish Book Council. 2014. Archived from the original on September 7, 2015. Thompson, Kim (January 1979). "An interview with Marv Wolfman". The Comics Journal. Seattle, Washington: Fantagraphics Books (44): 34–51. Decker, Dwight (January 1982). "The New Teen Titans". The Comics Journal. Seattle, Washington: Fantagraphics Books (79): 86–98. Groth, Gary; MacDonald, Heidi D. (March 1983). "Marv Wolfman On The New Teen Titans Part 2". The Comics Journal. Seattle, Washington: Fantagraphics Books (80): 70–85.